Five Royal Marine cadets from South Shields who were chosen to represent the North in celebrations marking the corps' 350 anniversary, have attended a special civic reception in their home town. Mayor Councillor Fay Cunningham and Mrs Stella Matthewson held a civic reception for 14-year-old John Knight, 17-year-old James Andrew and Nathan McColgan and 16-year-old Mathew Fenwick and James Bowman to mark their outstanding achievements. The youths were selected from hundreds of other cadets across the North East to go to Buckingham palace for the 350anniversary of the Royal Marines at which the Duke of Edinburgh was present. The Mayor said: "These young men are a real credit to the Borough. To have been selected to represent the North at the parade in London was a fantastic achievement and is testament to the skills and commitment they have shown in the corps. "It has been a real privilege to meet such terrific ambassadors for South Tyneside." The teenagers, who have been cadets for three to four years, take part in adventure training and are all working towards the Duke of Edinburgh Award scheme, in addition to learning the fundamentals of being a Royal Marine. The Marines have taken part in more battles in land and sea around the world than any other branch of the British Armed Forces. They are an elite force, trained for worldwide rapid response, and are able to deal with a wide range of threats and security challenges. 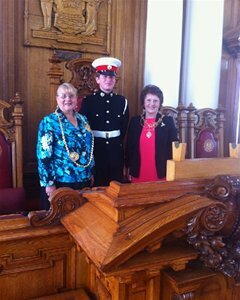 The cadets were each presented with a civic gift by the Mayor and Mayoress.